Overview of Lesson: After reading a book about the jungle such as Edward in the Jungle by David M McPhail or Rumble in the Jungle by Giles Andreae, you can imagine you are on a safari by creating a canteen. Canteens are the containers jungle explorers use to carry water. After you finish making your canteen, you’ll be ready for your own jungle excursion! The first step is to color the paper plates. Color the outside of the plate (the part you wouldn’t put food if you were using it to eat!). To make sure your canteen will blend in with the green plants and brown tree trunks in the jungle, you can color the canteen in camouflage, like below. Lay one of the plates flat. On the inside, place the quarter so that it is half over the edge of the plate. Trace the half circle with the pencil. Cut out the half circle. Repeat with the other plate. Put the two plates together so that the colored sides are facing out and the holes line up. Staple on both sides of the hole. Staple a few more times around the edge of the plate to hold it together. Ask a parent for help with this step if you need! This step will make the spout of the canteen. Measure two inches away from the short edge of the construction paper. Use the ruler to make a straight line from where you measured two inches to the opposite side of the paper. Cut along the line. Roll the construction paper into a cylinder. Hold it tight so it stays rolled for the next step! Place the paper cylinder in the hole of the paper plates. Slowly let the cylinder unroll until it fits in the space. Staple the construction paper so it will not unroll. And your canteen is complete! Edward in the Jungle tells the story of a young boy whose imagination becomes lost when reading his jungle books and playing with his jungle toys. 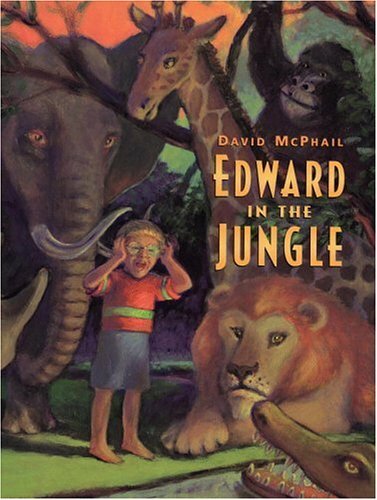 Kindergarteners through second graders will love embarking on this wild journey with Edward. "There’s a rumble in the jungle, there's a whisper in the tress; the animals are waking up and rustling the leaves!" Join this rhyming safari and meet everyone from the elphing elephant to the gangly giraffe, and maybe even the terrible tiger! * A great choice for kindergarten through second grade.